When we think about scuba diving, we think about gorgeous coral reefs, eerie wrecks, deep walls, sharks or schools of fish. But there’s another aspect of diving that hooked up many divers, muck diving. Muck diving gets its name from the sediment that lies at the bottom of many dive sites, a frequently muddy or “mucky” environment. And Dauin’s shore, is defined as sediment rich volcanic black and warm sand that peculiar marine life strives on. At first glance, it might not look like a divine underwater experience; muddy bottom, dark sand, sunken mooring lines, concrete blocks, old tires, will make the diver wonder what he got him/herself into. But a keen eye will quickly notice that next to this line hang a couple of ghost pipefish, on this concrete block, a juvenile painted frogfish awaits his prey, and a colourful nudibranch is grazing on the algae of the sunken tire. The magic lies in the small animals that inhabit this peculiar area. 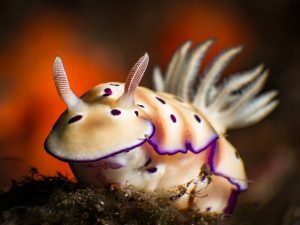 Nowhere else will be such abundant, rare and colourful sea creatures than on a muck dive. 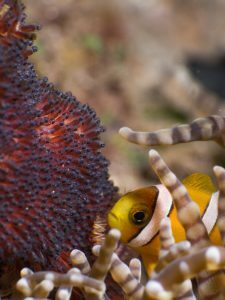 Usually juveniles or quite small fish, molluscs and crustaceans will be called “macro” from the photography term in which the size of the subject in the photo is greater than life size. The strangest shapes, the most vibrant colours, unusual patterns and curious behaviour. So much fun and, excitement is brought and shared with these types of dives. Improving your skills of spotting the animals, as they can be extremely well camouflaged, be able to witness a flamboyant cuttlefish hunting, a nudibranch mating, or encountering for the first time that super rare blue-ringed octopus you always dreamt of finding! The fun can go even further as nowadays, many budget cameras can be brought along to capture the grandeur of your favourite critters. We, at Bongo Bongo Divers, are immensely proud and happy to introduce you to our world-famous muck or macro dives. Divers of all level will be able to enjoy the rare critters that inhabits the Dauin shore from our comfortable “banka”, a local outrigger pump-boat, or just by walk in the water from the dive center. Dauin of course, still has great reefs and the famous Apo Island that shelters a great variety of hard and soft corals, countless reef fish and relaxed sea turtles is located less than one hour away from our dive center! Make some research on the particular animals you can find in these waters by reading blogs, or following photographers’ or dive centers’ social media pages, it’ll greatly help you find what you’re looking for!